35 w w w . M o d e r n T i r e D e a l e r . c o m M e r g e r s a n d A c q u i s i t i o n s M y father-in-law, Ed Tuck, was a pretty smart guy. Before becoming a venture-capitalist and founding Magellan GPS, he was a turnaround consultant to failing telecom businesses in the 1980s. (Read "A Sense of Direction," Ed Tuck and Mike Khaldun, Dog Ear Publishing, 2018.) I once asked him about the first things he did when he took over a failing business. Ed said that first, he'd find the person responsible for the mess and fire that person just to get everyone's attention. en once he got their attention, he raised prices. Ed said that most good companies underprice their products and services, and if they are losing money, that is especially true. So he'd raise prices until the first customers complained loudly, but he was OK with that. He guessed those customers might not be loyal or profitable and he could afford to lose some of them. But he kept on raising prices until the margins were healthy and the loyal and most profitable customers screamed. By then, he had a profitable business on a solid footing that could grow from there. 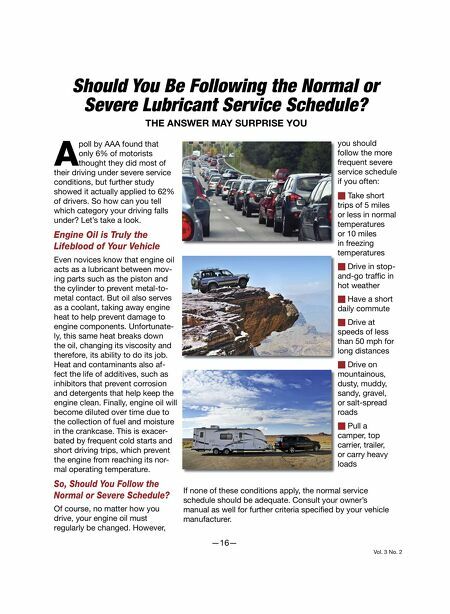 I've employed Ed's technique in tire stores, districts, regions and even helped at the national level for a tire retailer that was losing money in the early 1990s and had not raised its service and parts prices in five years. ere was some serious inflation back in those days, so imagine the catching up we had to do. We employed a new pricing strategy that was competitive with "signal" or "visible" items, but we arbitrarily jacked up the prices of everything else nationwide. en it dawned on us that doing business in San Francisco with its rents, wages and regulations was higher than, say Omaha or Fargo. Duh, right? So, we made market appropriate price increases and put the local districts and regions in charge of setting and keeping up with market pricing. A lot went into the subsequent 25-year run of success this company had (including retaining people, improving processes, and focusing on just three key goals), but the power of pricing was an unheralded part of it. You're in business for a variety of very good reasons, but the number one reason is to make a profit. If you can't do that, shut it down and go do something else. My view is life is easier with healthy profit margins. I once analyzed the financials of a tire dealer with a few stores in the Midwest that was deep in debt and considering bankruptcy. I benchmarked that business with a profitable client in Southern California and found the Midwest business' overall gross profit margin was half of what the SoCal's business was. Now, you can't tell me that the Southern California business environment is less competitive than the suburbs of some Midwestern city. ere was no particular compelling reason I found for this difference -- except the Midwest tire dealer was not aware of the power of pricing, and the SoCal operator was. If the first reason you're in business is to make a profit, the second reason should be to improve the value of that business. Typically, the business and real estate you own as a tire dealer is your largest investment by far. Improving the value of it with the power of pricing will enhance not only your current income, but also your net worth. "Market value" from a strategic acquirer is likely the high- est offer a profitable tire business will get. Strategic acquirers pay for your business based on its profits and the appropriate EBITDA multiple they apply (based mostly on their views of your size and attractiveness). I had the pleasure recently of advising a family-run business that was looking to sell after almost 50 years in business. In preparation for the sale, they continued to focus on what they did very well -- retain and motivate a seasoned group of tire store professionals and execute a disciplined sales and ser vice process within their stores. But they combined great people and execution with the power of price increases (often store by store) and targeted expense reductions. They got what I always strived for in business: the "triple bang" -- sales increases on top of margin improvement on top of lower expenses. The triple bang is a beautiful thing. Upon exit, they doubled their valuation from the offer they had received just 18 months prior. A lot of tire dealers I meet are baby boomers nearing or past retirement age. I've read that one's perception of risk changes as we age. Oen, we become overly cautious and afraid to take the bold steps like employing the power of pricing to get a business on a better footing. If you think this sounds like you, turn over the pricing responsibility to someone you trust, track it — and keep at it. ■ Michael McGregor is a veteran of the tire and service industry and a partner at Focus Investment Banking LLC (focusbankers.com/tire-and-service). He advises and assists multi-location tire dealers on mergers and acquisitions in the auto aftermarket. For more information contact him at michael.mcgregor@focusbankers.com. 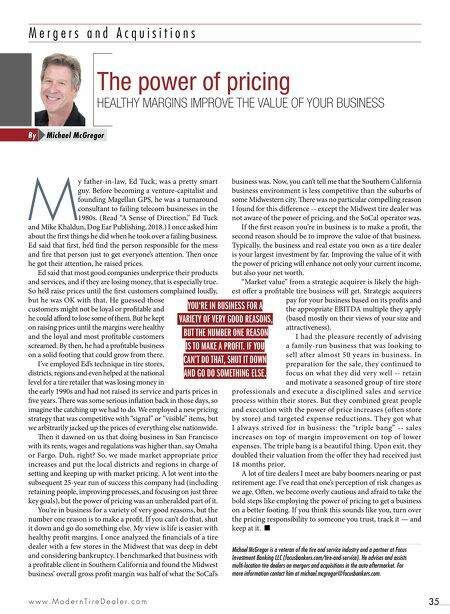 The power of pricing HEALTHY MARGINS IMPROVE THE VALUE OF YOUR BUSINESS Michael McGregor By YOU'RE IN BUSINESS FOR A VARIETY OF VERY GOOD REASONS, BUT THE NUMBER ONE REASON IS TO MAKE A PROFIT. IF YOU CAN'T DO THAT, SHUT IT DOWN AND GO DO SOMETHING ELSE.